Owning a lawn is fairly easy, all that is needed is to acquire a piece of property. Making your lawn look better, on the other hand, requires more effort and investment in resources. From years of experience, GoMow lawn mowing Coppell TX has the perfect ideas that can make your lawn look better. While some of these ideas can be done by self, using a professional lawn care service is still a better alternative. Read on below to check out the different lawn care and mowing ideas to keep your lawn looking clean and green. Water is an essential requirement for optimum lawn grass growth and development. It has a whole lot of functions it offers and a lack of it can cause myriad problems. Without adequate water in the soil, it is easy for your lawn grass to become dried-up and grow poorly. Water contributes greatly to the metabolic activities of all living things and plants are not excluded. The movement of nutrients and other important minerals through the intra-vascular system of the plant occurs better when the plant is adequately hydrated. However, it is important to note that too much water in the lawn can be a problem. It is advisable to water your lawn deeply instead but not all the time. Watering once a week with the water level up to an inch deep will give best results. Too much watering makes your lawn lose its natural survival ability against droughts. It can cause grasses to develop shallower roots because of the frequent water availability. For best results, water the lawn should be done once a week and should be at least an inch in height. Unlike inorganic fertilizers that leave traces of toxic compounds after use, organic fertilizers completely break down in the soil. This means they add a lot of nutrients in comparison with their inorganic alternatives. In addition, they don’t have any dangerous side effects that can develop as a result of using them. There are several organic fertilizers that can improve the look of your lawn without causing harm or expenses later. A common example is the grass clippings from your mowing activity. When returned to the lawn, your grass clippings are a healthy source of organic nutrients. 3.) Keep your lawn mower in good shape. A good lawnmower contributes a lot to the look of your lawn. A poorly-maintained lawn mower will perform badly when used to mow the lawn. Blunt blades are known to tear at your grass rather than cut smoothly. This tearing and ripping are unhealthy to your lawn as it leaves wounds on the plant leading to contamination or poor re-growth and development. To keep your lawn mower in good shape, clean it after every mowing session, sharpen blades often and store in a cool, dry place. Additionally, you can engage the services of a professional lawn care company to service your mower sometimes. GoMow lawn care service is highly recommended. Unevenly growing lawn grass is neither beautiful to look at nor healthy for long. To keep your lawn grass in good shape, mowing should be done at a specific height for best results. The recommended height of cutting your lawn is one-third of the grass length. This particular height is not too low or too high and has been tested to be the best height for your lawn. This particular requirement can be achieved easily by setting your lawn mower blades correctly. If you are good with lawn mowers, you may be able to do this yourself. Otherwise, a lawn maintenance service might check your lawn blades for you to be certain they are set correctly. Over time, the soil on your lawn will get compacted from all the activities carried out on it. All the foot traffic, parking of cars and heavy stuff on it, playing kids on the lawn etc will have a toll on your lawn after some time and it will get compacted. When soil gets compacted, there is a poor movement of nutrients, air, micro-organisms and other essential elements through it. This can lead to poorly-developing grasses because they are not getting enough nutrients to go by. To avoid this situation, lawn owners are advised to aerate their soil from time to time. Twice yearly can go a long way if done correctly. Soil aeration can be done with a manual aerator or a mechanized one for larger lawn yards. The aerator punches holes through the soil to loosen it up and facilitate the movement of nutrients, air, micro-organisms, and water. Do you want a better-looking lawn? 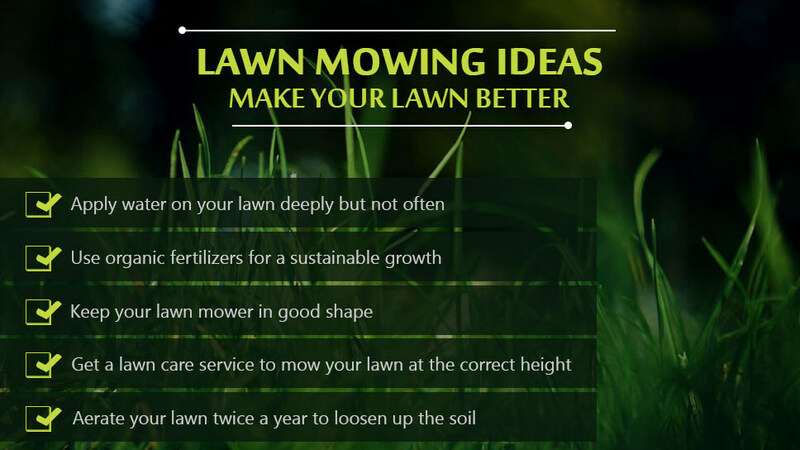 Consider these lawn care ideas from GoMow lawn maintenance, Coppell, Texas today! Click below to get a quick quote for your lawn care.